I’ve been a fan of Poe’s work since I discovered both the author and his creations. Even the life of this man has been of my interest. Also, manga and anime have taught me than even the simplest of the stories can have amazing artwork. 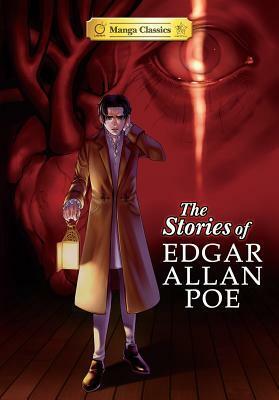 'The Stories of Edgar Allan Poe', which contains five of the most iconic tales of the author adapted by Stacy King, blends them both together with a great result. The selection is to be praised, as the four stories and the most memorable poem are presented in a singular manner, dressed with an aesthetic sometimes medieval, sometimes Victorian, an intriguing choice for such mysterious plots and that also matches the emotion in each of them. I do miss stories such as 'William Wilson and The Oval Portrait', as I strongly believe they would have looked stunning more than once. However, the characters from 'The Tale-Tell Hear't, 'The Cask of Amontillado', 'The Raven', 'The Masque of the Red Death' and, my personal, all time favourite among Poe’s stories, 'The Fall of the House of Usher'. Along with them, there were some extra pages with commentary from the artists and some sketches to show how the development process of certain panels and characters was done. Admitting that they are a nice addition will do, and have to add that it would have been even better to have them in all of the stories, since it is not the case. Each of the stories was drawn by a different artist, yet trying keep all of their styles similar, giving the book and homogeneous look. The fact that all of them are in black and white give them a singular enchant, although certain scenes are the exception to the norm; nothing can be perfect, not even something with Poe’s name on it. I found especially hunting the art for 'The Masque of the Red Death' and 'The Fall of the House of Usher', with a darker twist and interesting proposals in almost each of their panels, with the most intriguing perspectives and a good layout. There were even scenes that I would have found too challenging to be illustrated, but to see them perfectly represented … now that was a great surprise! Edgar Allan Poe was one the most underrated creators of the past, but this is one of those moments when you see that even with a Japanese look, he can send chills down your spine despite looking gorgeous and creepy at the same time. Yes, a weird, strange, mix, but a successful one. I would recommend this to anyone that like darkly twisted stories that give you something to think about, but especially for fans of Poe. This manga was a delight to read and see! Looking forward for something like this in the future.